One of the easiest ways to increase Facebook likes is, adding Facebook Like Box to your WordPress Blog. It requires only one click of your readers to like your Facebook page. And it’s the easiest way for readers to connect with you. Adding a Facebook Like Box is extremely easy. While you can use a WordPress plugin like Facebook Like Box, I’d recommend you to do it manually. 1. At first, go to Facebook Social Plugin Page. 2. Now you need to enter your Facebook Page URL (1). Then do a click on the outside of the box and it will show a preview of your widget. You can show single or multiple tabs like timeline, events, and messages under the like box. Just type the tab name (2). To show multiple tabs, use a comma-separated list i.e. timeline, events. You can specify Width (3) and Height (4) of the box. You can also use “Adapt to Plugin container width” (5) to fit the box inside the container width. You can hide the cover photo (6) or use a small header (7). You can also select whether to show friend’s faces or not (8). 4. Now login to your WordPress dashboard. Then go to Appearance (1) > Widgets (2). Grab Text Widget and place it on your sidebar (3). And paste the code there (4). That’s it; You are done. Now check your website, you’ll find a cool Like box on your sidebar. Hope you will get more likes than usual. The disadvantage of using this widget is it takes times to load. I think you will consider it for the sake of likes. After all, it is the best way to connect your visitors. BTW if you like this tutorial don’t forget to click on my Like Box, cause I placed it for more likes lol. Do let us know if you face any difficulties in placing this widget? And let me know your experience about Like Box widget. how can we use dark scheme here? I want to add in dark, please tell me. Thank you for the easy way to set up this feature, but mine isn’t responsive. Currently, I am using 290*240 size. It works good on all devices. I have changed the size to 290*240, but it still doesn’t work on Ipad and Iphone. Can it be the theme – Thrive Rise? Do it again by keeping “Adapt to Plugin container width” box unchecked. I have unchecked the the box, used 290*240, but it still doesn’t work. Can be. Contact with theme support. 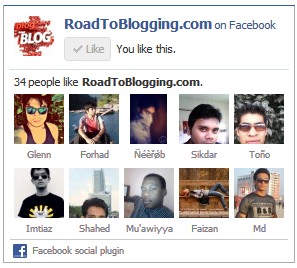 This is very helpful for bloggers to set up a Facebook Like box in their side bars. Chances are your readers are your biggest fans so you should make it easy for them to Like your Facebook page. But adding the box isn’t automatic so this article will be very instructional for people to add this to their websites. Hello, is there any way to see if visitor already liked (cliked on like button) and in that case prevent the popup to show? If you know some good resources where I can find a solution I would be very greatfull. I ahd no luck to find it so far. Thank you so much for the detailed tutorial on how to add Facebook like box to your blog, Facebook like box will only help you increase your blog Facebook Fanpage fans but will also show your readers that you have presence on social media and give them more trust into your blog so it works in both ways; promoting your Facebook page and your blog. I wish I found this post before … I found a little issue making it, but now it’s solved. Adding like box in ourown blog is the easiest way to increase social awareness. I wish I could post this before ;). Yeah, this box is very helpful for social exposure. Very detailed post. Another good idea to show a FB like box is with a pop-up when visitors land on your pages, still some visitors might not like it but it obviously helps. Yeah, using pop-up box is also a good idea. But sometimes it annoys the visitors. I don’t think that using pop-up box is a good idea because most readers hate pop-up boxes. It can be a good idea if you use it wisely like box will be pop up after few seconds, having simple box etc.